The Sustainable Development Goals come at a time when there is need for developing nations to step up their game. For a long time now we have had policies very well written out but they have not been implemented. These goals are supposed to change that. The goals have taken policy and displaced it with targets that people and nations can work hard towards achieving. At the reading of the Budget for FY 2015/2016 – the president launched the National Development plan. This plan which is supposed to guide the country into achieving Vision 2040 has got the SDGs embedded in it. Now, we do not have history on our side. We continue to have great policy but only for the books – most of it never gets enforced – as a result we the end users don’t see anything much changing. This time around I am hoping that this will change. I am optimistic and I am looking forward to having Uganda get back its glory. The National Development Plan (NDP) stipulates the Country’s medium term strategic direction, development priorities and implementation strategies. The first tenure was 2010 to 2014/15. This tenure will end in 2020. 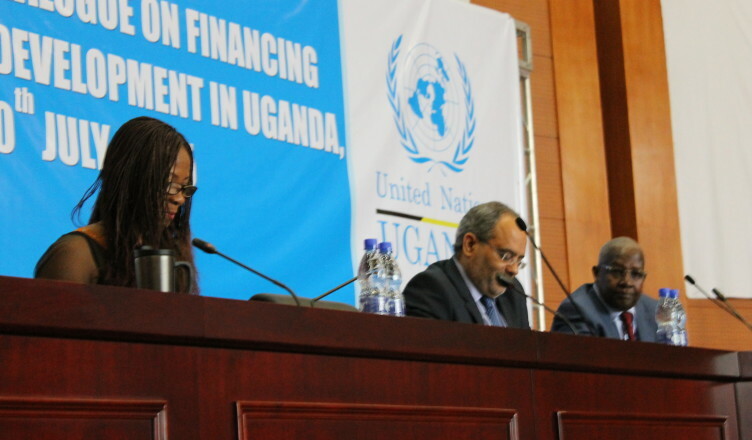 Listening in to Carlos Lopes the head of UNECA, and Hon Kutesa talk about the SDGs and financing for Development straight from the huge gathering in Addis Abbaba got me thinking. There are a number of things that we need to do right as a country to be able to make a mark in the next couple of years. Raising revenue for our countries or Domestic Revenue Mobilization is key to this SDG conversation because ‘AID’ as we have seen over the years is not sustainable at all. But this means shaking us the status quo – We are used to loans from IMF and the World Bank to finance projects. We are used to putting forward project proposals for exorbitant projects and having them approved. – But now we must look within. This means that we are looking at spending less and investing more as a nation. But also that we have concrete tax administration laws. According to a URA Commission Henry Ssaka – Ugandans already feel ‘over taxed’. For an average middle income citizen that has a job – they are paying Pay As You Earn [PAYE], and are ‘saving’ in a pension scheme whose money they may not be able to access unless they are very sick or dying. If they have a business they are paying VAT and 6% income tax – that goes directly to ones TIN account and so on and so forth. And yet the taxes a re not enough to look after the economy of the country and so we have to look deeper within and create systems that will sustain National development projects minus aid. Research shows that one of the main reasons as to why Ugandans have a phobia for taxes is because they do not see what their taxes are doing. That means that the tax body has got to clean up its accountability act so they are able to account for people’s taxes and say – here this is what your money is doing and this is how it benefits you as an individual. MNCs continue to make a lot of profit in our countries and yet they are not paying taxes. The tax base needs to widen to include the so many people and companies that use the roads with heavy trucks but get tax concessions that then triple their profits. In the last couple of months, I have had this word used so many times. But the most remarkable statement about DATA has been : “We cannot know where we are going if we do not know where we are coming from. Data can simply be defined as accumulated /gathered information. The kind that will help us to make evidence based decision. For example I was shocked to hear from a government official who said that there is no available information of how many Ugandans there are in the diaspora? How can you cook unless you know how many people are coming for dinner? You either end up [cooking too much or too little and sometimes the wrong type of food. Knowing that there are 2000 Batwa people living around Mt Muhabura will help the government know what schools they need, how their culture can be preserved and how they can be assisted to be recognized as Ugandans. It is important that we create Data collecting facilities, train data analysts and use the information collected to plan and make decisions. You are everywhere. You have a huge stake in this. It is not a government only problem. You will find a Coca Cola Kiosk in EVERY remote area on the continent. No one does not know about the soft drink. In most parts , there are lots of people that do not know that the AU, or the UN exists and its relevance. This is also a business opportunity. Imagine that a whole village was wiped away with the disease – you as the business person loses out because there is no one to buy your products and yet you already have existing infrastructure in place. Invest in the welfare of the end consumers of your product and you will be investing in the future of your business. That is why Private – Public Partnerships are now the way to go – there is something in it for all the parties. More than anything : the SDGs give citizens a responsibility and an opportunity to ‘get involved’ in their development agenda. We need to monitor the progress. Citizen involvement is usually championed by Civil Society Organizations and I think that their work is cut out for them. As the governments try and implement the policies and work towards making good – the role of monitoring is very vital. And we have that responsibility. Excellent reflection Ruth, another dimension that needs somega analysis is the balance between national plans as reflected in the national development plan against continental and global targets. Secondly, Uganda like many countries goes to the polls in 2016 – will the SDGS be harmonised with campaign manifesto and what will drive national budget – campaign promises or SDGS? We definitely hope that it will be the former and not the latter. Countries need to be able to define what it is that they stand for and stick to it in these SGDs.